Somewhere near the middle of the documentary, they flashed the statement, “the largest predictor of obesity is low income” and it made a lightbulb go on in my head. Was it true? I immediately logged onto my university library website and did some research to confirm if there was evidence to support this theory. There is and, in fact, there is so much and it is so conclusive that it is disturbing I hadn’t heard of it before (see here for lots of links). We often look at overweight or obese people with condescension, mainly because we think that being overweight is caused by a lack of willpower (see this forum discussion). But is it really? And if a lack of will-power is involved, then what causes this lack of will-power? One might ask, does a child choose to be born to an unmarried mother? In general, do people choose to be poor? Do they choose to be uneducated? Can will-power alone change these things? Metaphysical murmurings aside, the answer to these questions is obviously ‘no’. I grew up with a single mother and I can tell you that if Walmart had been around when I was a child, my mother would have done all her grocery shopping there, in order to pinch our pennies. A quick look in any Walmart ‘grocery’ aisle will clearly show you a multitude of extremely cheap, heavily processed, high-energy, low-nutrition ‘foods’. Fortunately, there wasn’t a Walmart when I was a child, but there was still plenty of 5/$1.00 mac&cheese, .10 cent ichiban, canned soups, canned ravioli, and wonder(fully-nutritionless)bread. Treats consisted of fast food (my fav was the .99 cent sausage mcmuffin with 21 grams of fat) and anything involving hamburger meat, which was never lean as far as I’m aware of. All of this changed when I was 18 and my adventurous friend, Aimee, convinced me to go with her to a Hemp Festival in Eugene, Oregon. I met a young man there–a wandering dead-head named Orion–and for three days, we were inseparable; I ate what he ate, much of which I’d never heard of before: kelp, sprouts, lentils and things like that. Everyone walked around that festival calling each other brother and sister and for one of the first times in my life, I felt accepted, even though I was chubby and obviously not a hippy. I returned to Canada from that festival with a hemp bracelet, crystals of all varieties, body odor, hairy armpits, far fewer brain-cells, far more self-esteem, and a decision to become a vegetarian. The idealistic peace & love feelings faded after a few months, but the Age of Vegetarianism lasted about 7 years for me (til I was 25 and my roommate caught me sneaking a chicken thigh from the simmering pot on the stove!). Becoming a vegetarian was such an invaluable, life-changing experience for me for one specific reason: half the crap I had been eating my entire life was off-limits. I had to completely retrain my tastebuds, learn how to cook for myself (half the restaurants back then didn’t have veggie options), and figure out what a complete protein was, which I learned was essential when my hair started falling out about 6 months AV. Many years later, I still struggle with eating healthy and avoiding the pitfalls of ‘cheap’ food. I do know that it is possible to eat nutritious meals on a tight budget (rice and beans are probably the cheapest meal around), but it does take time, education, effort and planning, which might not be available to lower-income people. If you had a similar childhood full of junk-food, what or who inspired and educated you to become a more healthful eater? If you’d like to learn more about this issue, please continue reading the research that I’ve collected, organized and summarized for you below. The following evidence is here because my research on forums and blogs indicated that most people, it seems, just want to believe that lack of will-power is the main predictor of obesity. I think this not only disempowers the lower classes even further, but it’s also an ignorant belief based on fear. After reading these, please give me your informed opinion–has it changed after reading this post? Chances are, if you are reading this post, you are not poor or uneducated, so consider that, and be compassionate. The abstract for this article can be found here. 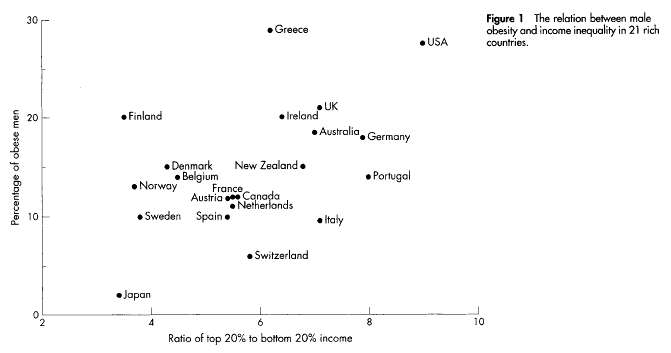 This study by Pickett et al., published in 2005, studied 21 developed countries and used United Nations data to analyze whether living in a culture with a large gap between the rich and poor, would be correlated to increased obesity. The graph of their correlations is telling, so I included it. See the USA all by itself in the upper right corner? That means it has both the largest gap between the rich and the poor and the largest occurrence of obesity. A link to buy the article is here. This page on the U.S National Library of Medicine has 257 links to research papers on this exact topic. There are 61 free full texts to view. Here is a discussion on Inspire, where people give their opinions on the matter and discuss whether they think its true or not, that healthy food is more expensive. This entry was posted in Health, Science and tagged academics, fast food, fat, Health, junk food, low income, obesity, overweight, poverty, research, science, socio-economic status, will-power. Bookmark the permalink.